The present St. Mary's Catholic Church was dedicated in 1874, but there has been a church on this site since 1860. The history of St. Mary's Catholic church begins with the celebration of mass in the year 1848 in Hippolitus Grignon's log house. This was not only the first mass in Appleton; but it was celebrated in the home of the first white man to settle within what is now the city limits of Appleton, Hippolitus Grignon having come to Appleton from Green Bay in 1835. In 1848-9 the famine was driving the manhood of Ireland to America, and from revolution stricken Europe was flowing to the United States the best blood of that continent. Some of these were attracted to the Fox River Valley by the prospects of work on the government canal and by the opportunity to acquire land in the vicinity of their labors. Patrick Shields, Louis Heintz, Adam Mertes, and a few others came to Appleton in the early '40s. In 1850 John Nolan, Timothy Garvey, Richard Farrel, Mr. Bradley, Frank Wirtz and a few others were added to the Catholic colony in Appleton. Missionary Fathers attended to their spiritual wants at first. Dr. Salzman, Father Casper Rehrl, Father Fusseeder, Father Pfeiffer, Father Louis Dael, and Father James Coulton were some of those devoted fathers who visited Appleton during the first decade. The latter was the first Irish priest to visit Appleton. During this period there was no church; but mass was celebrated in various places, viz. : in the home of Hippolitus Grignon, in the home of Adam Mertes, in the John Nolan boarding house, in the Third ward school and in the old courthouse. On the 29th of April, 1859, Theodore Conkey, M. L. Martin and A. B. Bowen donated, for church purposes, lot 1, in block 41, Third ward, city of Appleton, to John Henni, bishop of Milwaukee, and the Catholics of Appleton forthwith erected thereon a frame church at a cost of $1,700. On October 24, 1862, Father Louis Dael, J. McCaghery and J. Smuddie purchased for St. Mary's congregation lot 4, and a little later lots 2 and 3, in said block 41, and a parochial school was erected thereon. Thus in 1864 the first parochial school in the city of Appleton, and one of the first in the State of Wisconsin, was opened. Missionary Sisters from Barton taught in this school. They did not remain long, however, and were succeeded by a Mr. Johnston. The school was discontinued after a short time for lack of funds. Father Louis Dael was the first resident priest, coming in 1860 and remaining till 1867. He was succeeded by Rev. Father Wilkins who was pastor for one year. 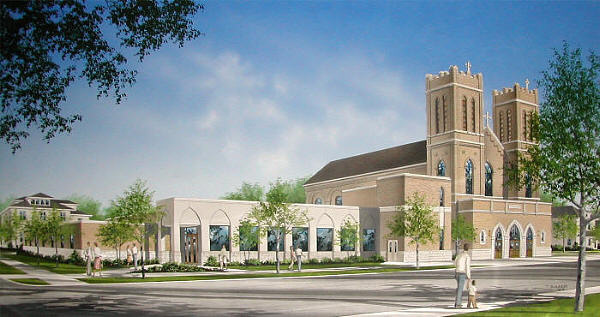 It was during the latter's administration that the German Catholics withdrew from St. Mary's and established St. Joseph's congregation, the mother church paying the new congregation $3,000. Rev. Father Walsh, who succeeded Father Wilkins, remained but a few months, giving place to the Rev. Father Verberk, who was pastor of St. Mary's from 1868 till 1872. 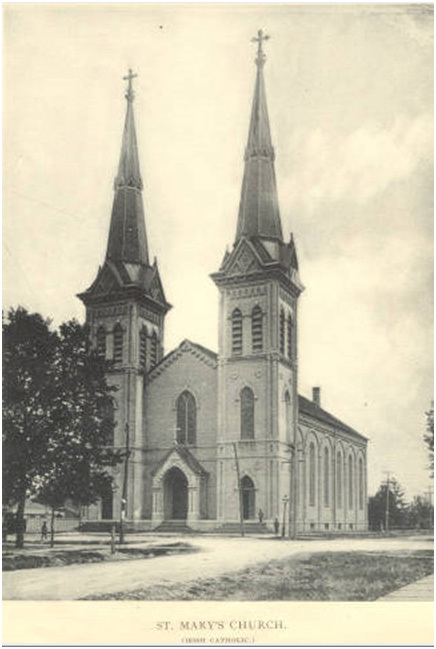 St. Mary's was the first Roman Catholic church in Appleton and the only one until 1866. At that time the Irish and German Roman Catholics were separated into two parishes by order of the Milwaukee Diocese. Both factions worshipped at the Irish St. Mary's until the German St. Joseph's church was built on W. Lawrence St. in 1868. Architect and Third Ward resident Thomas O'Keefe designed the present church. Massive wind storms toppled the south steeple in 1923 and 1930. A 1923 building permit lists the cost of a frame steeple at $10,000. Both steeples were eventually replaced by the parapets seen today. This building appears on both the 1978 and 1989 historic building survey. For a complete history of the parish, see St Mary's history on the church's website. used with permission of the Appleton Public Library.